It’s imperative that I eat meat in sordid quantities at least once a week. Whether it be a steak, a burger, roasted lamb served on a plate so heavy it makes the table groan, or crispy-edged, deep fried pork chops, I gotta have my meat. It’s solid, two-fisted eating where I leave the table afterwards with my lips glistening from grease and fat. This is macho eating at its finest. 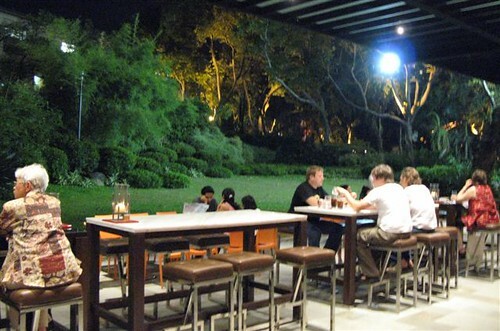 Myron’s Place at Greenbelt 5 certainly doesn’t look like a suitable venue for indulging my feral carnivore. Its stunning terracotta interiors, restrained lighting, and oak paneling seem more suited for lunch with the ladies; although I must say that those plush sofas strategically located at the front and back of the dining room are good enough to collapse on after a cannibalistic carousal. I can’t tell you how many times I’ve engaged in some serious meat-eating at the Myron’s in Rockwell — yes, that Myron’s — which sparked a hullabaloo on this website almost two years ago. And I foresee that its more dapper sister, Myron’s Place, will soon become a mecca for meat-eater me as well. Ah, but looks deceive. You wouldn’t be able to tell from my pretty lace top, flowing skirt, silver sandals, and large hoop earrings that I’m a woman on a meat mission. But first, dishes to awaken the appetite. 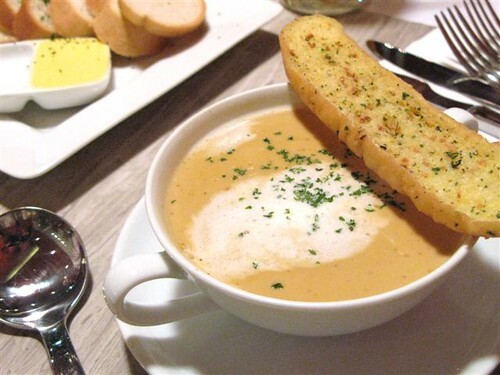 The prawn bisque (P160) is thick and velvety, the cream carrying the essence of shellfish and sea. The risotto balls with chorizo (P180) are surprisingly al dente. I’ve seen people look at them with suspicion and sniff, “They’re not fried. Risotto balls should be fried.” But I adore the soft bitey-ness of the short-grained rice giving way to a surge of salty from the chorizo. “I love it,” I squeal. I opt out of the Oysters Rockefeller and instead order the fried oysters (P330). A subtle crunch followed by the grittiness of cornmeal invokes the bi-valves’ briny succulence. 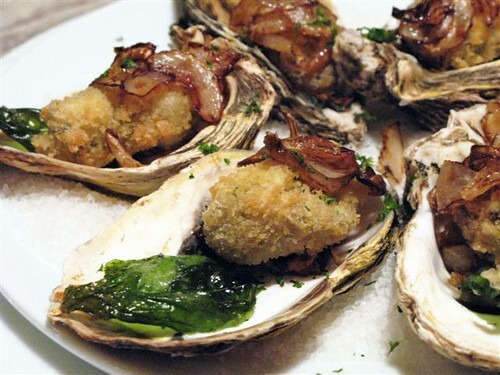 The Southwestern sauce that comes with the oysters sparkles with cumin, its coral color evidence of its zest and tang. Eating it with the crispy fried basil leaf together with the sauteed onions adds another dimension of texture. Little girls like my Boo have no patience for such foods which she perceives as downright silly. 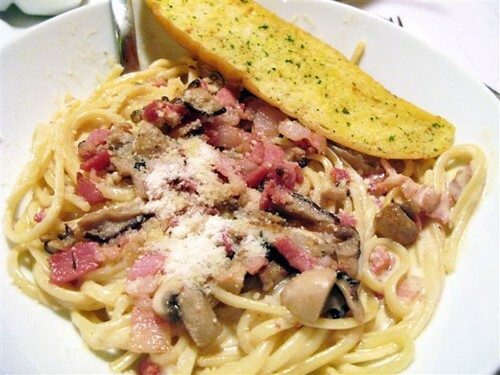 “Just give me carbonara,” she says plaintively. And that it is, this hefty bowl of noodles canoodling with chunks of bacon and ham. Upon Boo’s request, the parsley and other ingredients offensive to a five year old have been omitted, replaced instead with a touch of cream. I try a bit ”“ the noodles slip sinuously in my mouth. I’m tempted to bribe my daughter for a larger share. My roast beef (medium rare, please; Franco cut P1,350; cover photo) is served ceremoniously, its size momentarily stalling all conversation. I’m starting to get giddy, and uncontrollably, I clap my hands briefly in glee. It’s impossible for me to behave with much maturity around 450 grams of meat, its reservoirs of fat glinting like mischievous eyes. Every slice turns on a flood of juice, every bite a delight. When I’m in this advanced state of vigorous eating, I have little interest in conversation. Or sharing. I need to concentrate when in touch with my authentic, barbaric self. Which is just fine with my Bin really, since he’s quite enamored with his black & blue burger (P425) a fine incarnation of Wagyu beef. Its mammoth load of onion rings is an imminent landslide on a too-soft bun that I’m told will be replaced soon for one with more structural integrity. I’ve written much about my husband’s penchant for well-done meat, something I deride. Still, I concede that this burger ”“ coated heavily in peppercorns — pleasures me with its warm, dripping juices that threaten to run down my arm. Next time, I want my own burger: medium-rare with a seared crust and meat that runs pink at its edges with a pulse of red at its center. I wipe off a spot of drool. One would think that packing away an appetite of this caliber would preclude the possibility of dessert. For shame! You know me better than that. I don’t disappoint, most of all where dessert is concerned. My Bin can out-eat me when it comes to savory food, but I’m the champion when it comes to having my steak and eating my cake too ”“ or in this case, a banana cream pie (P170). This is where my beautiful flowing skirt comes in ”“ for all of its charming femininity, it’s got an elastic waistband which is good, because it offers no impediment to my macho eating. The only impediment I see in this restaurant however is the seemingly constant flow of pedestrians who cut through the place from the outside to get into Greenbelt 5. What is this, Grand Central Station? I’ve not seen a banana cream pie quite like the one served at Myron’s Place. A pastry cream with a flawlessly glassy veneer piggybacks on a crust that mysteriously remains crunchy while most have turned soggy. Owner Mon Eugenio teases me that I’ll never guess what the crust is made of. I do, but only after several attempts. And no, I can’t tell you what the mystery ingredient is. My Bin has very specific instructions for how his banana split (P170) should be constructed: two scoops of chocolate ice cream, and one scoop of strawberry which must be in the middle; and it’s not a banana split without crushed peanuts and pineapple and maraschino cherry toppers which Boo promptly steals. While my Bin enjoys his dessert immensely, soon he concedes defeat, leaving me to polish off his and my desserts. 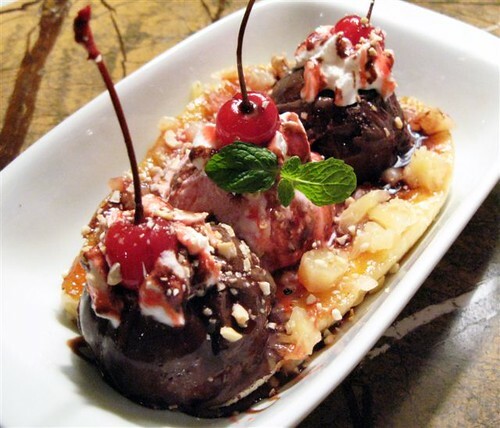 oooohhhh imma go and try that banana cream pie! not much of a meat lover but i love love love bananas in all shapes and forms hehehe! 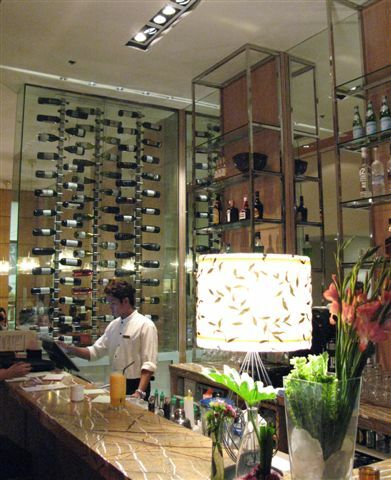 I was supposed to try this new branch of Myron’s last week, but my friends chose Zuni instead. I did go in to check the menu, though, and Mon Eugenio was very accommodating. 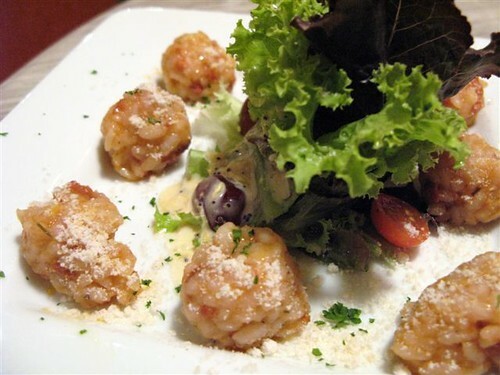 I want to try those risotto balls and fried oysters! I’m no banana fan, but I want to bite into that bruleed caramel top! The smoothness of the cream makes me wonder, though…is there gelatin in there? And by the way, do they also serve the bread pudding from the Rockwell branch? LOVE that! 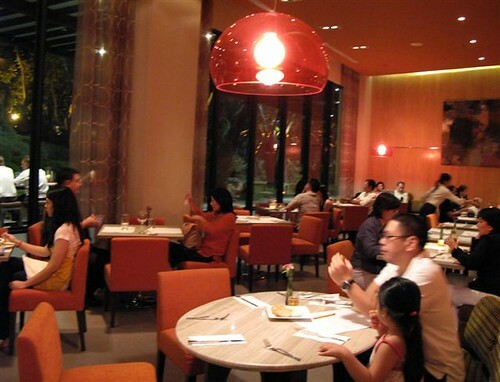 to my felow meat eater, nice post… i had a grest rib eye dinner at Prime 22, i think ull like it there too, check out my post..
love ur post… didnt like this resto the first time i tried it.. The pastry cream must have been lightened with cream and set with gelatin. It was left to set in a mould lined with cling wrap, hence the creases on the side and the smooth, shiny surface. And to keep the crust from getting soggy, they must have placed the moulded pastry cream on top at the last minute… just a guess. The crust looks almost like a compressed cereal or granola bar. I love bruleed bananas. 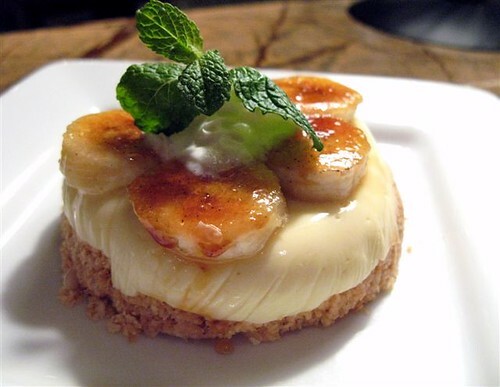 I used to make banana creme brulees- yummy. Just the place for a semi-carnivore like me. Noodles canoodling?!? That must have been a sight! Love your writing, love your style, and I love your smile! sorry, didnt like the first time id tried at rockwell, they served cold on my cornedbeef and rice. maybe they improve a lot now. hi Lori, whenever I visit your website, I never know what to do first….read the piece or study the pictures. I love the way you articulate yourself; your pictures blow me away. After eating a full meal, I visit your site and your pictures make me feel like I can devour an entire meal again soon after. Your website is an absolute fave and a resource I keep returning to over and over again. kudos! I had dinner with a freind in Myron’s a couple of Fridays ago. I had the pumpkin soup and we both ordered separate black and blue burgers. The soup was great but the burgers left a lot to be desired. We asked that both sides of the bun were to be toasted, it was served with just one side toasted. 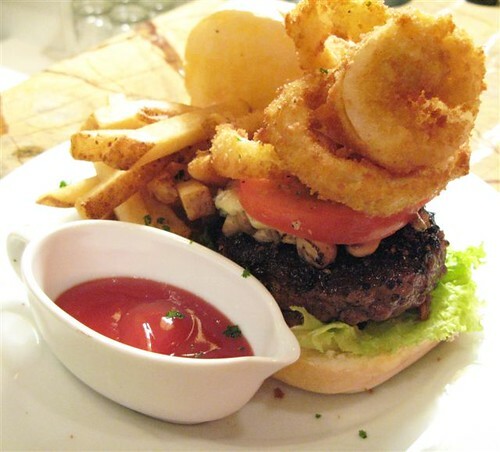 The onion rings were stone-cold, french fries were barely warm and same with the burger patty. They were nice enough to take it back and give us a fresh batch but still the patty was tepid at beast a tad greasy. Disappointing first visit but I’m willing to give it another try. have been to myron’s place 3x on the strength of your and MarketMan’s recommendations. either your taste buds are more ‘evolved’ or i’m harder to please. i keep going back because like you, i want to give them the benefit of the doubt. but sadly, it disappoints. the risotto balls are ordinary tasting and dry. the shrimp bisque is salty..
the baby back ribs are salty..
they do have a winner in the carbonara. We always order it split everytime we go there. the individual portions come out big enough to satisfy. i doubt i’ll be coming back anytime soon.